Inside Real Estate came to ShiftUP Consulting looking to set up a listings website surrounding the Real Estate industry. The back-end entry system we set up for them has the ability to add new categories, sub-categories and listings to the website instantly. 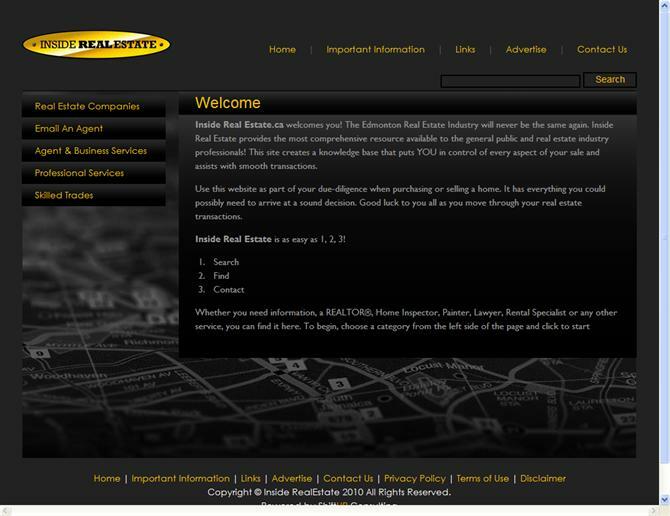 The draw to their website, however, is the extensive list of participating real estate agents and the ability for users to email all of them from within insiderealestate.ca. One of the interesting points we built into this website was the menuing system we created for this website. The letter based divisions in the left-side menu sub items (IE. Skilled Trades are divided up into A-C, D-F, etcetera), are calculated automatically so as to only show so many entries per subdivision. That is to say, if we entered several more 'C' entries it would automatically redivide itself to A-B, C-D, etcetera.